My first experience of being in Abercych was during a residency in 2 Penrhiw in 2011. The residency was a unique opportunity to work in a beautiful and inspiring place with the gift of time to explore my practice and follow interests without judgment or pressure. Having a space to play and explore in such a supportive and enriching place fueled my practice and process and led to a body of work that began during that residency. 2 Penrhiw is an enchanting space to work and be; it is the kind of place that works on you as much as the other way around. I left with a sense of clarity and openness, and a greater sensorial perception of my environment. Simon Whitehead and Stirling Steward were such generous hosts; their creative expertise, knowledge, and care for their surroundings are a continuing inspiration. In January – February 2018 I did a five-week residency in 2 Penrhiw as part of my Creative Wales Award. I had many exchanges with artists living and working in the area as well as the continued support from Simon and Stirling. It was a time to read, walk, play, swim, rest, dance and work in the garden and woodland. I connected with artists living and working in the area as well as developing relationship with others in the Maynard Friends groups, which has since led to a commission opportunity. It was a time for undoing as much as doing. My interest in sustaining chimed with Maynard’s own enquires and working in such close proximity strengthened this research and gave me the confidence to work in a way that counters the seemingly normal capitalist drive to produce. The work done on that residency has since quietly fueled and resourced all the work I have done since. The sounds I recorded whilst on walks became the soundtrack for a commission with SiD; the sticks I was processing into kindling have appeared in many of my scores; the text written has been made into audio walks; the photos documenting the walks I did have made a series of small books; the talks and walks with friends made in the area and artists living and working there revealed an interest and enquiry in how to choreograph with clay; and the practices relating to permaculture and non-production has laid the groundwork for how I want to work and enabled me to mentor and work with other artists on the ecology and sustainability of their projects. 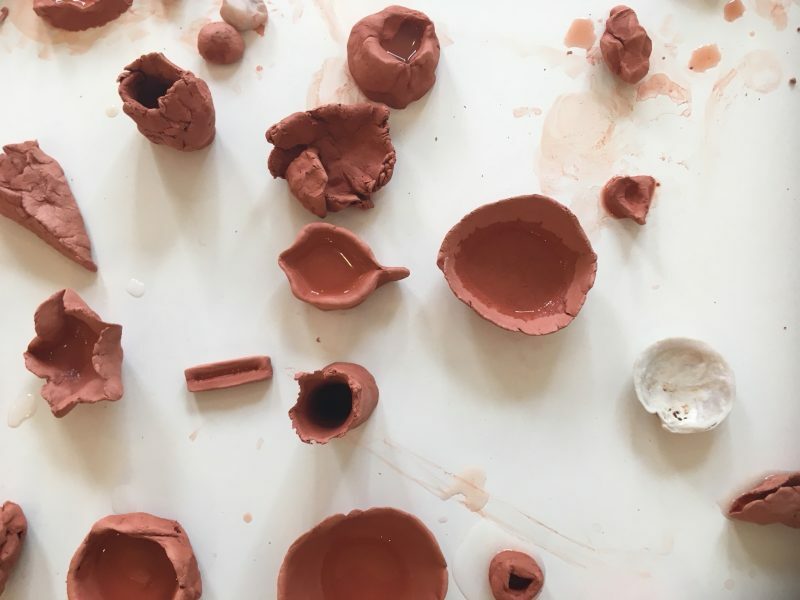 Maynard have invited me to share work at the proposed Festival in September; explorations with clay, water and collective making that grew from this residency. Since the residency at the beginning of 2018 I have continued to be mentored by Simon, regularly meeting to share practice and resources. Simon and Stirling have given me the opportunity to test and research ideas at the Twmpath and have given me more confidence to work in a slower and more sustained way, allowing outcomes to arrive out of an awakened and interconnected practice. As an independent artist it is so important to feel part of something, arts practice thrives on connections, exchanges and community, which is at the heart of what Maynard is offering through their artist development training, residencies, friends gatherings, Twmpaths’ and micro festivals. It is both radically political and deeply nurturing and feels vital in these current times. Joanna has recently completed a performance commission for SiD. Jo met the company directors and dancers in Abercych during a Twmpath and a Maynard artists gathering last year.